Samford University will observe homecoming with a full line-up of reunions, anniversary observances and other special celebrations Friday-Sunday, Nov. 6–8. Alumni and friends from 17 states and at least one foreign nation have preregistered for events, according to Samford Alumni Programs Director Molly McGuire England. Some activities, including classroom lectures by nine visiting alumni and the student-sponsored homecoming ball, will be on Thursday. The crowning of the homecoming queen and king will be a highlight of the 7 p.m. ball in Seibert Hall. Throughout the weekend, display boards created by student organizations will decorate Ben Brown Plaza. Viewers may vote for their favorite homecoming-themed display. In addition, “Faces of Perry County,” a photo exhibition by Samford director of photography Caroline Summers, will be on view in the Samford Art Gallery. Events on Friday include a 100th anniversary celebration of Samford’s journalism program, a vespers service, reception for volunteers and the traditional homecoming banquet. Alumni of the Year Karen Duncan Carlisle, Todd Carlisle and Larry Cox, and Outstanding Young Alumnus Andrew Patterson will be recognized at the banquet. Saturday’s events begin with a 5K/Fun Run sponsored by the Aerospace Studies Club to honor America’s veterans, followed by faculty lectures on the culture of the 1960s by Mark Baggett and Delane Tew, and archaeological research in Galilee by James Strange. Samford’s McWhorter School of Pharmacy will present a continuing education session on allergy and immunology. Morning highlights also include an open house for Brock School of Business’ new Cooney Hall, a retirement reception honoring Special Collection librarian Elizabeth Wells for her 40 years of service, an outdoor A Cappella Choir performance and the grand opening of the new Art Lofts building. The journalism and mass communication department’s Wall of Fame ceremony will honor Catherine Bryant Allen, a Samford graduate, author and longtime Baptist communicator, and the late Albert Scroggins Jr., who served as Samford JMC department head and public relations director in the 1950s. Midday events include tailgates and reunions on the quad — more than 20 in all — and the Class of 1965’s 50th anniversary luncheon. The Bulldog Walk will cheer on the football team as they prepare to take on Clark Atlanta in Seibert Stadium at 2 p.m. Pregame festivities will begin at 1:30 p.m.
After the game, it will be reunion and party time for the undergraduate classes of 1990 and 2005, pharmacy classes of 1990, 2005 and 2010, and Pi Kappa Phi fraternity, which celebrates its 90th year as a Samford chapter. Orlean Bullard Beeson School of Education will present 100 Learning for Life awards at its centennial celebration dinner. The event will culminate a yearlong salute to the 1915 beginnings of the Samford education program. The Sunday schedule includes the traditional Golden Bulldog Brunch for graduates from 1965 and earlier, and introduces several new events: a campus prayer Walk, a Bible study led by Samford president Andrew Westmoreland and a tour of Birmingham Botanical Gardens led by biology professor Larry Davenport. The newly renovated university center dining hall, the caf, will be open for brunch. In addition to football, Samford’s weekend sports agenda includes volleyball action against Furman at 7 p.m. on Friday and against The Citadel at 7 p.m. on Saturday. 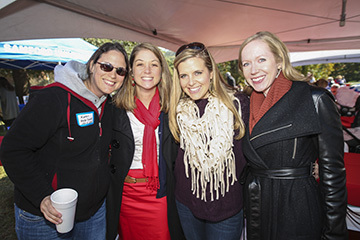 For more information on homecoming at Samford, call 205-726-4315 or email sualumni@samford.edu.